Leeds United's new loan signing, Jack Harrison. Picture courtesy of LUFC. Leeds United have secured their fourth signing of the summer by finalising a season-long loan deal for Manchester City winger Jack Harrison. City manager Pep Guardiola has agreed to send Harrison to work under United head coach Marcelo Bielsa following lengthy discussions between the two coaches over a move to the Championship and Elland Road. The 21-year-old was unveiled by Leeds last night having passed a medical earlier in the day. Stoke-born Harrison moved to Middlesbrough on loan last season but played just four times and failed to start a competitive game. 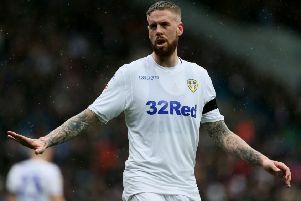 Guardiola, though, sees long-term potential in Harrison and was persuaded by Bielsa to allow him to leave the Etihad Stadium for the forthcoming Championship term. Leeds’s transfer business has intensified dramatically in the past few days with left-back Barry Douglas arriving on a three-year deal from Wolverhampton Wanderers and striker Patrick Bamford poised to sign in a £7m switch from Middlesbrough. Bamford was scheduled to begin a medical with Leeds on Monday and should complete his transfer in the next 48 hours. Ronaldo Vieira’s United future is in doubt after Sampdoria tabled a multi-million pound bid for the midfielder. The Serie A club are willing to pay around £7m for the 20-year-old having made a move over the weekend.